By arranging pigments on a DNA scaffold, an MIT-led group of researchers has developed a light-harvesting material that closely imitates the construction of naturally occurring photosynthetic structures. The researchers demonstrated that their synthetic material could absorb light and effectively transfer its energy along precisely controlled pathways. This kind of structure could be integrated into materials such as textiles or glass, allowing them to produce or otherwise control energy coming from sunlight, said Mark Bathe, an associate professor of biological engineering at MIT. “This is the first demonstration of a purely synthetic mimic of a natural light-harvesting circuit that consists of densely packed clusters of dyes that are precisely organized spatially at the nanometer scale, as found in bacterial systems,” Bathe said. One nanometer is equal to one billionth of a meter, or 1/10,000 the thickness of a human hair. Bathe is one of the senior authors of the novel study, together with Hao Yan, a professor of chemistry and biochemistry at Arizona State University, and Alan Aspuru-Guzik, a professor of chemistry and chemical biology at Harvard University. Lead authors of the paper, reported in the November 13 issue of Nature Materials, are MIT postdoc Rémi Veneziano, former MIT postdoc Etienne Boulais, and Harvard graduate student Nicolas Sawaya. For billions of years, photosynthetic bacteria and plants have evolved efficient cellular structures for producing energy from the sun. This process involves trapping photons (packets of light energy) and changing them into excitons — a particular kind of quasiparticle that can carry energy. Then, energy from these excitons is transported to other molecules at a complex of pigments and protein known as a reaction center, and ultimately used by the plant in order to build sugar molecules. Although researchers have developed reliable methods for photons (fiber optics) and electrons (such as semiconductors), finding ways to control excitons has proven to be more challenging. Four years before, Bathe, Yan, and Aspuru-Guzik started working on synthetic structures that could imitate natural light-harvesting assemblies, which are normally found in cell organelles called chloroplasts. These assemblies have a complex structure that effectively captures and transports solar energy at the nanometer scale. What’s really amazing about photosynthetic light-harvesting is how well it meets the organism’s needs, when it is required, every absorbed photon can migrate through the network of proteins that surrounds the reaction center, to generate electricity. Gabriela Schlau-Cohen, an MIT assistant professor of chemistry who is also an author of the paper. The researchers started to imitate these structures by attaching light-harvesting pigments to examine scaffolds made up of DNA. In the past several years, Bathe’s lab has set up new ways to program DNA to fold in specific shapes, and last year, Bathe and his colleagues developed a new computer-programming tool that automates the method of designing DNA scaffolds of almost any shape. In the study, the researchers planned to employ DNA scaffolds to spatially organize closely packed clusters of pigments similar to those present in nature. Boulais discovered a 1977 paper that revealed that a synthetic pigment known as pseudoisocyanine (PIC) aggregates onto particular sequences of naturally occurring DNA forming the structure the researchers were looking for, called a J-aggregate. However, since this method employed naturally occurring DNA, there was no way to control the size, spacing, or 3D spatial organization of the clusters. Veneziano tested the ability of the researchers to template the J-aggregates into discrete clusters with distinct 2D organizations employing synthetic DNA, and Sawaya and Boulais worked to computationally design customizable, synthetic DNA scaffolds that arrange these aggregates into circuits that absorb photons and carry the resultant excitons along a predictable path. The researchers can control the precise density and location of the clusters of dye molecules, which sit on a firm, double-stranded DNA scaffold, by programming specific DNA sequences. They computationally modeled how different factors such as the amount of dye molecules, their orientation, and the distances between them would influence the effectiveness of the resulting circuits, analyzing several versions of the circuits for their effectiveness of energy transfer. 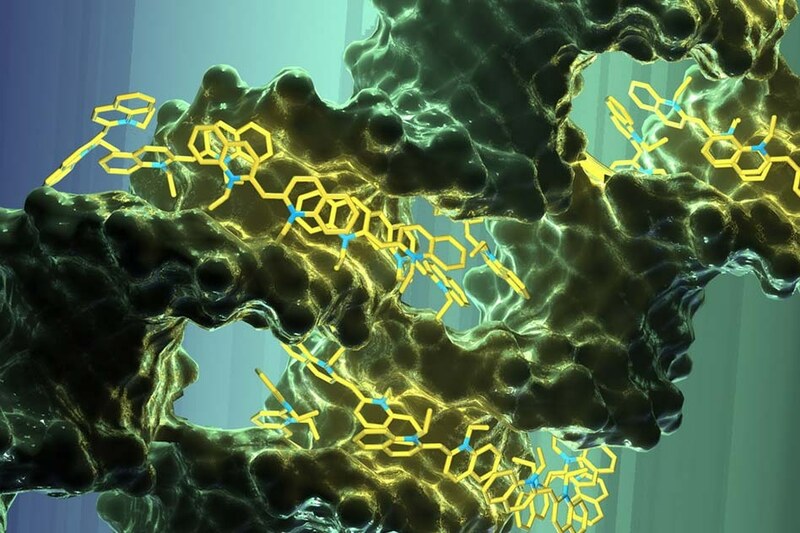 Photosynthetic organisms organize their light-harvesting molecules precisely using a protein scaffold. Up to now, this kind of structural control has been difficult to realize in synthetic systems. It looks like DNA origami provides a means of mimicking many of the principles of photosynthetic light-harvesting complexes. Gregory Scholes, a professor of chemistry at Princeton University who was not involved in the study. Part of the ASU team, headed by co-author Su Lin, carried out a series of spectroscopic measurements to show that the designed DNA structures generated the preferred J-aggregates, and to characterize their photophysical properties. Schlau-Cohen, who employs advanced spectroscopy methods to analyze light-harvesting systems, both synthetic and natural, revealed that these dense pigment assemblies could effectively absorb light energy and transfer it along specific pathways. “We demonstrated the ability to control the traffic patterns using J-aggregated dyes, not just how far the excitons can travel. That’s important because it offers versatility in designing such circuits for functional materials,” Bathe said. The researchers consider that these synthetic structures could be incorporated into 2D and 3D materials such as textiles or glass, providing those materials the capability to absorb sunlight and change it into other forms of energy such as electricity, or to harness or store energy. These structures could also form a new basis for quantum computers, employed at the nanoscale, using excitonic circuits as quantum logic gates. Now, the researchers plan to study ways to make these synthetic light-harvesting systems better still, including trying to find more effective pigments, which may lie in the newly introduced Max Weaver Dye Library at North Carolina State University, which accommodates 98,000 unique dyes. “There are still a lot of ways that we can imagine improving this,” Schlau-Cohen said. “We have the ability to control individual molecular parameters to explore the basic science questions of how can we transport energy efficiently in a disordered material.” Schlau-Cohen is also the senior author of a companion publication that will be published next week in the Journal of Physical Chemistry Letters. Other authors of the paper that appears in the Nature Materials journal are MIT postdocs James Banal and Toru Kondo, who headed the Journal of Physical Chemistry Letters paper; ASU Professor Neal Woodbury; ASU Senior Research Professor Su Lin; ASU postdoc Sarthak Mandal; and former ASU postdoc Alessio Andreoni. The study was funded by the U.S. Department of Energy through MIT’s Center for Excitonics, the U.S. Department of Defense’s Multidisciplinary University Research Initiative, the Office of Naval Research, the Natural Sciences and Engineering Research Council of Canada, and a Smith Family Graduate Science and Engineering Fellowship.